I've divested all my units (3500) in HC surgical, with no reasons in particular except to re-balance my portfolio. Raffles medical has continued to be a poor performer for me, and is the biggest drag as it constitutes the majority of my portfolio. Nonetheless, I will continue watching this counter and will likely average down. Two other counters I'm closely monitoring is Jumbo Group (which I already own a small parcel of), as well as Comfort Delgro, with both demonstrating recent weakness; Jumbo due to its stagnant results and CDG with its recent taxi-competition. Although CDG is potentially losing revenue due to the various incentives Grab has offered to lure its cabbies, I do believe that CDG may eventually come to an agreement with Uber to counter this. How effective it will be is another question. Nonetheless, CDG is looking slightly more attractive now that it has reached its 2014 levels, but i do not think that it has bottomed yet. It will be difficult to catch the bottom for sure and if I were to enter, I would have to commit to averaging down in order to get the best out of it. It is worth noting that whilst the taxi business does take up a huge chunk of CDG's operations, they do have other operations including public transport and engineering. Furthermore, Grab/Uber, whilst snatching market share from CDG, is burning lots of cash in the process. Their model is not without it's downside as well. (Please note that I'm not speaking from personal experience, but based on what I've learnt from some of the Uber and Grab drivers when I tried the app myself); "it is annoying that a percentage of our earnings goes to the company", "Taxis are actually good too, they pay a high base rental, but they do not have to pay a percentage, which then varies with their earnings. Earning more means losing more". I'd leave things here for now, thanks for reading. The month of July heralded new highs in the stock markets globally, with DOW hitting a new high and the STI reaching its previous peak. The performance of my personal portfolio has not been great though, with Raffles Medical being the worst performer. That said, I'm not too concern about things yet and I am still confident about its' growth in the long term. Profits are getting squeezed, and with analysts predicting the fall in NPAT due to their expansion and upgrading plans the next 3 years, buyers seem to be rushing out of this counter. As such I have taken the opportunity to acquire a small parcel of another 1500 shares which brings my total RMG counter number to 4300. I will continue to monitor this counter and I'm currently planning on scooping up more if the weakness continues to persist. I have also acquired 4000 shares in Jumbo (42R), which has retreated back from its previous peak, hence presenting with a decent buying opportunity IMO. Similarly, if this counter continues to present with weakness, I may scoop up more as well. Although this counter has been compared to other services/food-services counters which are cheaper, I believe that this is an unnecessary comparison as they are all intrinsically different. Jumbo has a great product and they are already taking the right steps (I believe) in their overseas venture. With Regards to my REITs counters, they have all been doing well despite the recent Fed rate hike in June. IMO this is because most of these REIT counters are still fairly valued. Looking back, Parkway REIT has been by far my best performer, with about a 28% gain since I bought (nearly at it's bottom) nearly 2 years ago, with 2 years of dividends to boot on top of it. On hindsight, this highlighted to me that if I strongly believe in the intrinsic value of a counter, I should not be too worried about the general market sentiments, which I was afraid of at that point in time. That's all for today's update, best wishes to everyone out there! I took advantage of the recent weakness to take a small bite (3500 units) of the company again @ $0.475 per unit. This entry price represents a 27.5% discount as compared to my previous exit-price. In addition a unit price of $0.475 represents a P/E ratio of 25 times earnings (EPS of $0.019), a stark difference to the previous P/E of 35. Once again, this is a decently risky share. As per most small-cap medical groups, revenue and income are heavily dependent on the key medical practitioners. Furthermore, this is a rather new counter, without a longstanding track record. I'm also uncomfortable with the O&G segment remaining as a significant bulk of the revenue, due to falling birthrates. However this is somewhat offset by their expansion of other specialisations (Derm, Surg etc). In addition, it is worth noting that there was some insider selling (though insignificant) at the start of the year, and the end of last year. The recent sell-down is also questionable due to the large volumes unloaded (and loaded), although there has yet to be any news. There may be a tinge of panic selling amongst this, which I am banking on, but I definitely won't jump to conclusions yet. To conclude, this is likely to be a short-medium term play rather than a long term one as this is more based on a bit of speculation and a 'value-play'. This has been the talk of the town for the past month or so, and literally (not really) everyone is applying for it, so it's not surprising that I did as well! For those of you who do not know yet, the IPO was priced at S$0.81, at the lower end of the expected range. I balloted for 6000 units and received 2000, as per the pre-decided allocation algorithm for the public offer as shown in the table below. Basically if you are successful in your application ('by luck') you would be allocated a fixed number of units based on which 'range of units applied for' - column 1. E.g. if you applied for say 15,000 units, and your ballot was chosen, you would be issued 3000 shares. Surprisingly there were 4 successful (and probably more who applied and were unsuccessful) applicants for > 2M units. Also, as shown in the table above, the "mode" - ie the "greatest number of applicants bidding within a range" was for the range of units between 100K - 199.9K units. Bigger players like these bidders may have felt that there was a decent chance of a successful ballot using the "ATM method" due to this IPO being a huge float. After all, the ATM method only costs S$2 as opposed to the placement method which costs 1%. In addition, the placement shares was 1.8x subscribed (excluding connected persons) and the public offer was 5.1 times subscribed. I think that this is a pretty decent set of results considering the size of this offer. I shan't bore anyone with the same details that most other bloggers have already covered about the financial statements and the forecasts, but I would just focus on my personal thoughts. The yield is decent at the offer price of $0.81, being 5.43% (FY2017) and 5.73% (FY2018), but not fantastic, as most REITs would have a yield greater than this. However, I like the monopolistic nature of this business. Although one might argue that Netlink's operations are heavily subjected to regulation by the authorities (note: this occurs every 3-5 years), and hence have minimal room for growth, I believe that this is in fact a good thing. Being heavily regulated would mean that there is minimal room for competitors to thrive in, and even more so for potential new-entrants. This is evidenced by the $732 million grant issued by the government to Netlink in 2009 to build Singapore's NBN network. Unknown to some, though the NBN network in singapore is "public-owned" (via ownership of shares in Singtel previously, and now "nearly-separated" into 2 entities via the IPO), the NBN network in some other countries is "state-owned". An example is Australia, where Singtel's subsidary Optus operates in. In these countries, just like in Singapore, the Telcos have to pay the NBN company (the "equivalent of netlink") the access fees to access the NBN. In my opinion, the chance to own a part of the backbone of a state offers significant safety and stability in this volatile market. There have been a number of people who has comparing Netlink to Hutchinson Port Trust, which isn't exactly a good comparison except for the size of the IPO and the relatively-similar subscription rate. In my opinion, the previous time such an opportunity existed on the SGX was during the IPO of SMRT in year 2000. Similar to Netlink, SMRT had stability and a good infrastructure, but a low yield and potential for growth. I won't derail further, but in short, SMRT's IPO price was $0.61, and only gained a mere 0.1% (boring wasn't it?) on it's debut, and was later re-purchased by Temasek Holdings for $1.68. The PE of this is understandably high (due to depreciation being factored in), hence excluding it from your calculations allows would allow you to appreciate it's cash generating ability better. This has already been mentioned in several articles before so I would not be discussing this here, and I've just included this in case any of you have not come across the idea yet. I've talked previously about how my portfolio was heavily concentrated on the healthcare industry, so what is concentration, or rather the opposite of it; diversification? Basically to concentrate is to put many, if not all your eggs into a single basket, on the other hand, to diversify is to not put all your eggs into a single basket. Concentration and diversification can take place on many levels, note that for simplicity sake, I will only be talking about diversification. 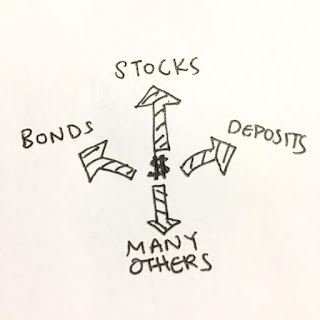 It is also important to understand that diversification is a term specifically applied to stocks, but can also be applied in other situations as well, but in this post, I will be talking about diversification from an investor's point of view. At a very specific level, an investor can diversify by spreading his investments in several companies from the same sector. For example, instead of buying stocks in a single company in the telecommunications sector (e.g. Singapore telecommunications), an investor can diversify by purchasing stocks in multiple companies in the same sector (e.g. Singapore telecommunications, StarHub and M1). For various reasons. One reason for diversification which applies nearly in every situation would be to reduce (spread) risks. Hypothetically, if a company were to encounter operational difficulties, chances are, it is LESS likely that another company on TOP of the first also encounters these problems in the same period of time. 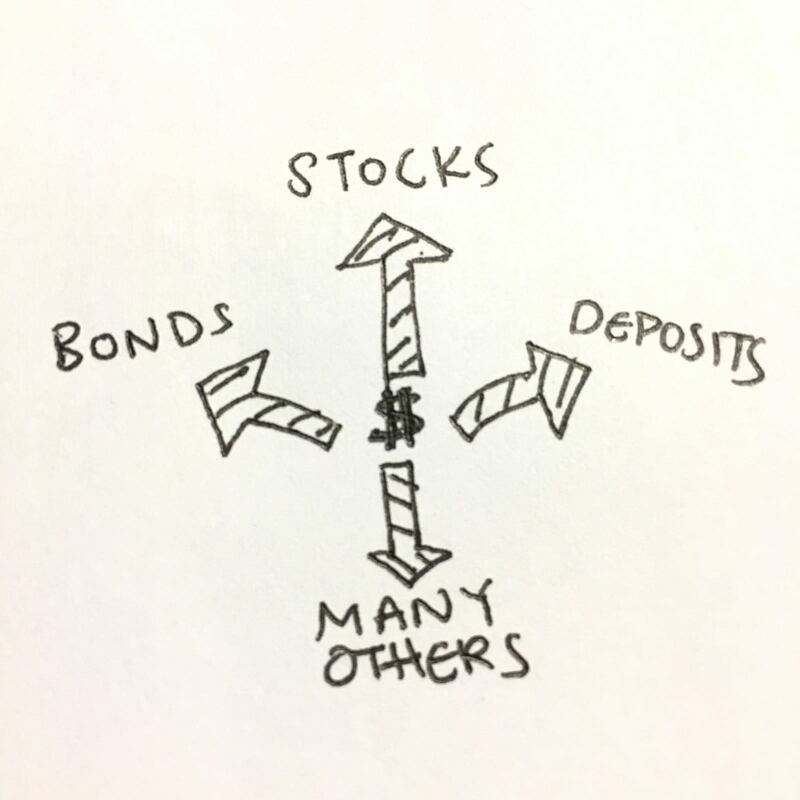 Basically, if you were to invest equally and hold stocks in company A, B and C, if company A's stocks were to plummet, you will be less likely to suffer a lost as significant as if you were to only hold company A's stocks. Sometimes there is no good and available reason to make such a choice to diversify. Because as you may have probably realised, the converse can happen as well! If you were to spread your investment between company A, B and C, and if A's stocks rockets, whereas company B and C's share price stagnates, you only gain 33% of what you would have gained if you had chosen to concentrate your investment funds in company A. Maybe the question we should all be asking ourselves is, how much are we willing to (potentially) lose (or gain?)? Maybe. For example, the companies in question may each capture different sections of the market. A random example would be Dairy Farm Holdings vs Sheng Siong. The former generally targets the more upscale market with more premium goods whereas the latter targets the value-for dollar market, even though they may both belong to the same sector - supermarket retail. Hence if you were to equally believe in the growth or stability of these companies, it will be prudent to diversify between these companies in the case of unforseen circumstances which are more often than not, uncontrollable. One thing you may be thinking about at the moment is; "maybe I should diversify, the company I have invested in (/am thinking of investing in), has bad management, a bad track record, and it also lacks transparency". The question you should be asking yourself is; why even invest in them then? Because the charts show that there is a chance of the share prices rocketing? Well, then you may want to consider whether your goal is to invest for the long term, or gamble for a quick buck. Ok, it seems that I have gone slightly off tangent here, so let us continue our original discussion. 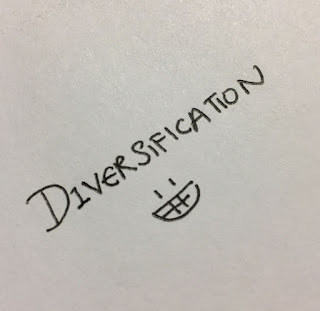 The level of diversification; Sector Diversification is once again something to consider as well, as it also potentially reduces/spreads your risks. One reason is because different factors (or rather exposures) play a huge role in determining the success of companies in certain industries. 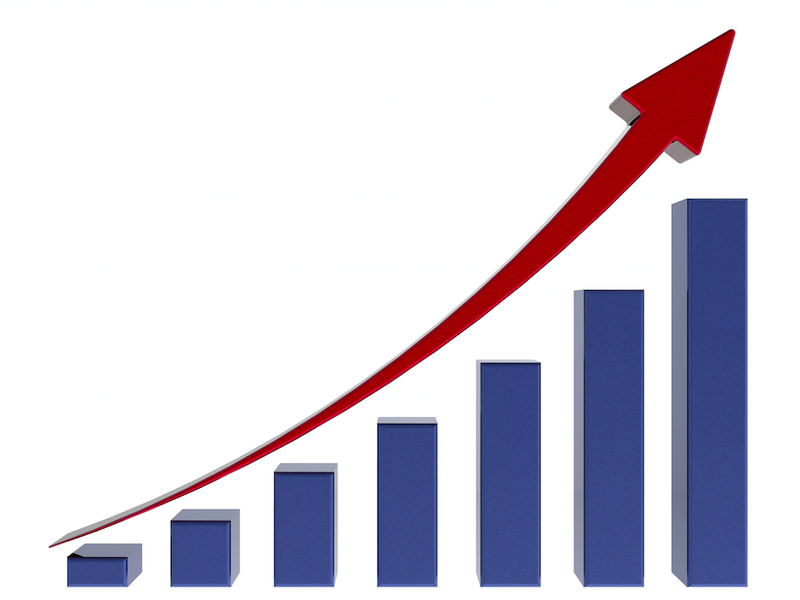 - The banking and finance industry is exposed to a cyclical trend of the economy. This is probably one of the reasons why many gurus constantly highlight the importance of diversifying between sectors and keeping track of % exposure to each sector. Something important to consider as well. Aside from stocks or securities, there are other modes of investments to consider, which include, Bank Savings Accounts (albeit often carrying low interests), Bank Fixed Deposit Accounts, Government Bonds, Company Bonds etc. Please note that there are many others as well and I will not be going into them as I believe these are the most common ones a new/basic investor may be considering. I also would not be going into detail with regards to each specific mode of investment (not in this post), as my point here is that, there are many ways and levels in which an investor can choose to spread his/her risks. Some important questions to ask is therefore; what am I seeking to achieve from the investment? (capital gain vs yield) How much am I willing to risk? How much do I need the money I am putting down as an investment? Have I done sufficient research to ensure that I am not diversifying for the sake of it? Perhaps when you are able to answer all of those questions then you have an investment idea that is ideal for your own palate. I have divested all my holdings (3000 units) in Singapore O & G at an average price of $1.31. (Current share price of Singapore O & G is $0.665 which would work out to be $1.31 before the 2 for 1 share split). I still agree that Singapore O & G has a lot of potential to grow. It does still have a reasonable share price at the moment based on its earnings, however, with healthcare counters already taking up the majority of my portfolio, I decided that it was in my best interests to rebalance my portfolio. This is so that I will be able to jump on any opportunities in the market that may come in the future. 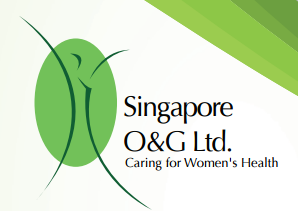 The reason why Singapore O & G was chosen out of all my healthcare counters, is because I believe that whilst it carries decent value, the other healthcare counters I currently hold are more "undervalued" relative to Singapore O & G at their current prices, and I believe that they would bring about greater value in the short to medium term at least. I am also slightly troubled by the declining birth rates. Although Singapore O & G has been able to consistently grow its market share, there would eventually be a point in time in which it's ability to grow my acquisitions becomes more and more limited. This is understandable because as more and more suitable practices are being acquired, the "less suitable" ones increase in proportion to the overall market. That aside, I will however be likely to reinvest in Singapore O & G if its' plans to expand overseas materialize. The demand for medical tourism seems to be plateauing and unlike my other healthcare counters, Singapore O & G does not have overseas exposure. Doing so would decrease concentration risk and provide much greater opportunities to grow. With EPS growth, share price generally follows. This is because the company of interest would appear to be cheaper once its financial statements containing the growth in earning is reported. This then results in metrics such as P/E (price to earnings ratio) and EV/EBITA (enterprise value to [earnings before interest, tax, depreciation and amortisation]) which measures how cheap a stock is, looking more favourable. Investors then flock to the (literally) cheaper shares, pushing up share prices, until buying and selling equilibrates. This all sounds great doesn't it? So what are the downsides? Well for one, growth companies are often relatively smaller (we're talking both about organisation size as well as market capitalisation here). It is arguably more likely that a company with a small market capitalisation (maybe in the Low- mid millions) can grow, or rather increase shareholder value than a large corporation worth billions*. The flipside, as you may already have guessed is that small companies often bear higher risks and may more often be speculative in nature. Larger companies tend to have a longer track record, have a better organisational structure, and have more experienced management teams, which more often than not are absent from small companies. Bear in mind that there are always exceptions to this, for example, a large company (in terms of market capitalisation) could have just experienced a rapid increase in share price due to a sudden event leading to an increase in demand, and in this case, the company as well as its management may not have had a longstanding track record. Hence, proper and in-depth research is also necessary to determine whether or not a company has a good record, or whether it has purely been benefitting from tailwinds. Stable-Income paying companies are often not growing as much, relative to the growth companies that is. Most of these companies are industry behemoths and instead of reinvesting earnings for growth to generate value for shareholders, earnings are mainly returned to shareholders, probably because management has decided that it is the better option to do so (due to size and product saturation etc as I've mentioned earlier which limits growth). This has its pros and cons as well. Even though history doesn't indicate the future, but it's arguably somewhat suggestive of the future. A 10 billion dollar company with lots of assets and infrastructure and an experienced management team that has been paying dividends consistently in the past 20 years would be more likely than not still be able to continue paying its next/upcoming dividend, right? Which is why I love income stocks; because of its relative stability. Relative's the word, and the stability is not a given. I'll once again reiterate, they are more likely to be able to remain stable and continue paying dividends, but the converse can possibly happen as well, although the chances are somewhat smaller. Noble group is one notable example (even though not a great example for picture I've just painted as it does not have a Long and consistent dividend history), and for the benefit of the readers who have not heard of it; basically noble was a blue chip share that was removed from the index this year due to many issues affecting it. A large income stock with a 6% annual yield would have yielded 60% of your initial investment after 10 years (assuming no reinvestment of dividends in shares). 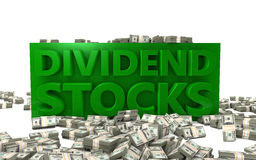 On the other hand, a small cap growth company with a dividend of just 2% can potentially provide a 5.18% yield on the initial investment amount after 10 years, assuming a 10% annual dividend growth, which is equivalent to the levels of many income paying stocks. With capital gain to boot (which may be more than 60% if income were to grow for >10 years as investors will often push prices up before any financial results if they already expect the company to continue growing), they can potentially overshadow income stocks. Personally I believe that there is no good reason to fully focus on either small cap growth stocks Nor large income stocks. The mix between them is subjective and also depends on the targets you have set for yourself. I do prefer growth stocks over income stocks as I am investing mainly for the Long term. Thank you for reading, and I would be happy to hear any opinions on this 😁. Success does not come to you. You go to it.